Mehmet Ali Sanlikol, third from left, composed “Palindrome” based on Turkish music. Sanlikol is the director of DÜNYA, a nonprofit organization concerned with developing and learning about world music. 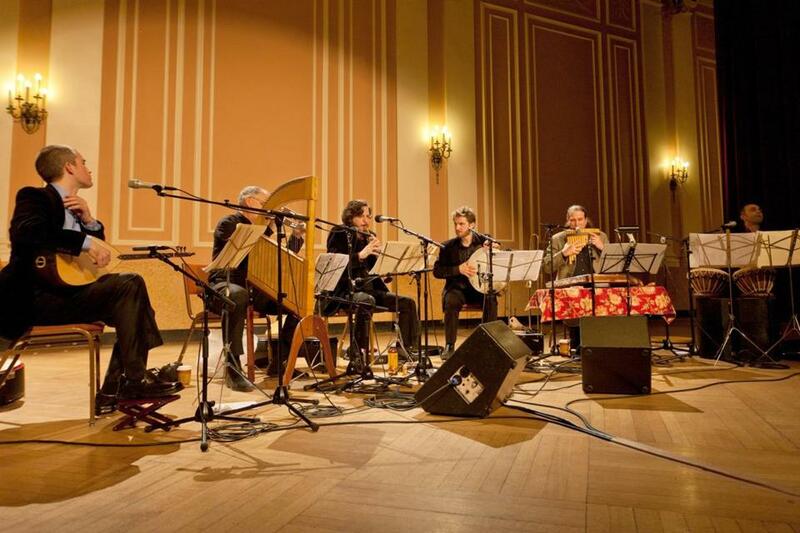 DÜNYA took the stage at the American Islamic Congress in Boston on May 19 to perform Sanlikol’s original score “Palindrome.” Sanlikol also teaches music at Brown University, Emerson College, College of the Holy Cross, and Rhode Island College. Q. What does DÜNYA mean? A. It means “the world,” or “the globe.” The word itself is traditionally Arabic. Over the course of many centuries and different cultures borrowing it, it’s sort of been transformed. Sometimes it may also refer to the spiritual world, but that depends on the culture and context. Q. Can you tell me a little bit about “Palindrome”? A. Well, a palindrome is something — whether it’s a number, word, or something else — that reads the same way both forward and backward, like “madam” or “radar.” But the idea for the title and the music came from my personal experience as a Turkish immigrant. I left Turkey in 1993, at the age of 18, to study jazz at Berklee. After Berklee, I got my master’s at the New England Conservatory, and I unexpectedly rediscovered Turkish music. I think that’s portrayed, structurally, through my composition. It starts off quietly with ethnic instruments and just two musicians. As the music goes on, it starts becoming more and more inclusive, adding other instruments and it eventually turns into a jazz combo, with all 13 musicians. And then it ends again with quiet, ethnic instruments. Q. When you say you “unexpectedly” rediscovered Turkish music, what do you mean? A. I think it was early January in 2000, and I was playing a game of Risk. A friend of mind thought it would be funny to download MP3s of an Ottoman Turkish gentry band, like old bands that used to accompany Ottoman Turkish armies to battle. I heard this folk song and I just couldn’t wrap my head around it. I’d been writing and playing music since the age of 5, but I was just so stuck on this song. After that, I was hooked on learning more about their music. Q. How does “Palindrome” speak to the larger immigrant community? A. The piece was based so heavily on my personal experience, but the goal is providing an inspiration to all immigrants who are in the process of their own self-discovery. Q. Has Boston influenced any of your work? A. The city of Boston has made this possible for me, actually. I was able to come here in search of what I thought I wanted [studying jazz] and given the time and the freedom to explore that and create a much more complete version of my own self and my identity. I thought going to Berklee was like going to paradise. I was the hippest cat in town, walking around my hometown with that Berklee brochure. When I got to the lobby [of Berklee], it was a bit of a cold shower, but all I cared about was absorbing as much information as possible. And then after I was done with Berklee and I was attending the Conservatory, I was able to do an exchange program in Istanbul. Plus, having Harvard right around the corner, I could sit in on their Ottoman studies lectures. Q. What kind of music do you teach at Brown, Emerson, Holy Cross, and RIC? A. At Brown, I teach lessons of ethnic instruments, and a “Music of Turkey” seminar. At the College of the Holy Cross, I teach mostly Western music, intro to composition, jazz, and music theory. And at Emerson and RIC, I teach world music lectures, and some classes on Indonesian music. Q. Do you find that you draw on your own experiences when teaching? A. When I was in school, a professor once told me the best examples are the ones that come from personal experience, and I’ve carried that idea throughout my years of teaching. Sometimes I play my own music in the class, or talk about my roots, and hopefully students can understand and relate to that. Q. DÜNYA’s work was nominated for a Grammy last year, right? A. We were not among the final four in the world music category, but we were on the ballot as finalists among 60 or so other projects in the world music category. Q. Can you tell me a little bit about the CD? A. It was a world music CD, and ironically it actually doesn’t have any jazz on it. There’s a lot of Greek, Armenian, and Jewish music. I think that’s what most people know DÜNYA and myself for. But it seems that New England has the hots for world music and not so much for jazz. It was really interesting and kind of ironic that I came here to be a jazz musician, and at the time there were probably 10 jazz clubs. And now, it’s 2012, and there are two and a half left. I sort of lived through that decay, but I think it all worked out for the better.